As the future of our planet becomes more uncertain, companies across industries are stepping up to reduce their impact on the environment. An easy way to reduce your impact is by recycling paper, plastic, metal, and glass products rather than throwing them in a landfill. Recycling expired documents and electronics is a great way to “go green,” but you can’t simply toss old materials into the recycler—you need to protect the information they contain first. Unfortunately for individuals and small businesses who choose to shred their files themselves, most recycling facilities do not accept loose shreds. 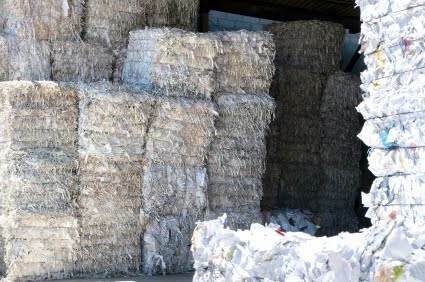 Fortunately, most large scale shredding providers partner with recycling facilities and send in bales of paper shreds that can be recycled. If you are looking to protect both the environment and your private information, shredding services may be the perfect solution. Taking steps to protect the environment not only helps save the planet, but it has unintended positive benefits for businesses, such as attracting eco-friendly customers and adding a layer of security to your expired files. 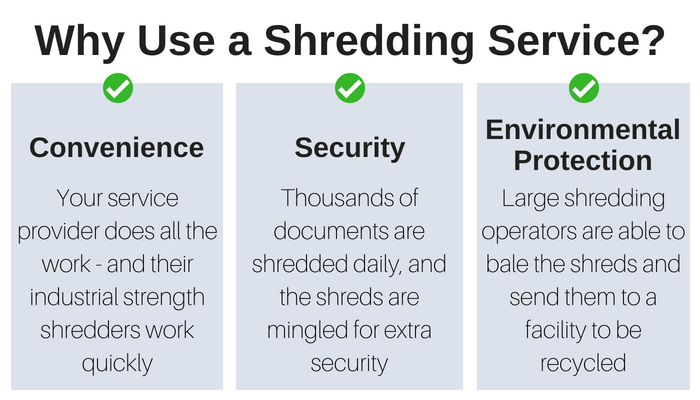 When you use a shredding provider that also offers recycling, you ensure your information is safe. Through the shredding process you know your files are protected, and through the additional recycling process your files are reduced to a pulp and reformed into new paper—further protecting your information while reducing your footprint. Keeping the private information of your business, customers, and employees should be a top priority. And keeping that information safe doesn’t have to be a trade off with protecting the environment. There are a variety of shredding services available—we can help you find a solution for high volume, mid-sized, and low volume shredding projects. Electronic devices keep a digital trail and bits of information on them even after you delete everything off of them. To ensure your electronic data isn’t stolen you need to physically destroy all devices that contained private information at any point in their lifespan, and professional electronic destruction services will leave your devices utterly dysfunctional. Recycling is an excellent way to reduce your impact on the environment and help decrease your consumption of limited resources. With professional destruction services you don’t have to choose between security and the environment. You can rest assured that your items are safely recycled. You don’t have to compromise your eco-friendly practices to protect your information—shredding and recycling go hand in hand. To find a shredder in your area who will recycle your shreds or your old electronics call us at (800) 747-3365 or fill out the form on the right.